Broad product range and sizes ( ½" – 20") provide a solution to fit any system needs. Complete coil hook-up kits available for ease of installation and serviceability. Bell & Gossett coil kits and balancing solutions make selection, ordering, and installation a breeze for the engineer, customer, installer, and help reduce field problems during and after system commissioning. We offer a number of ways of controlling flow to optimize the efficiency of the circuits and total HVAC system and a solution to your balancing problem. Want to MakeYour Building Green? Pump less water in your HVAC System! Pumping less water in a hydronic system is the easiest way to save money on electric bills every month. While this may not earn you LEED points for a GREEN building design it does go a long way toward reducing the overall energy consumption of a commercial building. Unfortunately though, it takes more than just a design calculation to make this happen. When the system is being designed, the designer can make adjustments to the flow rate by changing the heat transfer selection criteria for coils and radiators. Out in the field though, the pump and the pipe find a “natural” flow rate regardless of the design calculation. The illustration shows how a typical pump and system curve react. Between design safety factors, and installation modifications, it’s very easy for a system to operate with 15%-20% more water than expected. The actual flow rate is determined by the way the pipe and fittings are actually installed, and the pump’s ability to deliver water. When too much water is flowing you spend more money - money to move the water, and money to heat or cool it. You can see that the example pump operates with an extra 1.5 HP. That difference in electricity adds up over time, and is never noticed. If the system gets the opposite though, too little water, occupant comfort is affected, and they’ll find a way to become comfortable, which usually means opening valves for more water flow and as a result, more money to operate the system. Adjusting the water flow rate is called “balancing”. Often, the pumps are larger than they need to be, and head and flow rates are over estimated. The end result is that system flow will be greater than design. Options to reduce this flow include limiting the pump discharge flow, or limiting the heat transfer devices’ flow rates. To limit flow at the pump, a Bell & Gossett Triple Duty Valve is used to throttle the pump flow. The extra advantage to the system is that the built-in check valve prevents reverse system flow, and depending on the type of Triple Duty Valve, it may also reduce the number of fittings required to install the pump. Plus, limiting the system flow saves pump energy. The other way to adjust the system flow is to balance the flow rates at the heat transfer terminals. Bell & Gossett Circuit Setter® Plus and Circuit Sentry™ balancing valves allow the water to be reduced to the optimal flow rate. 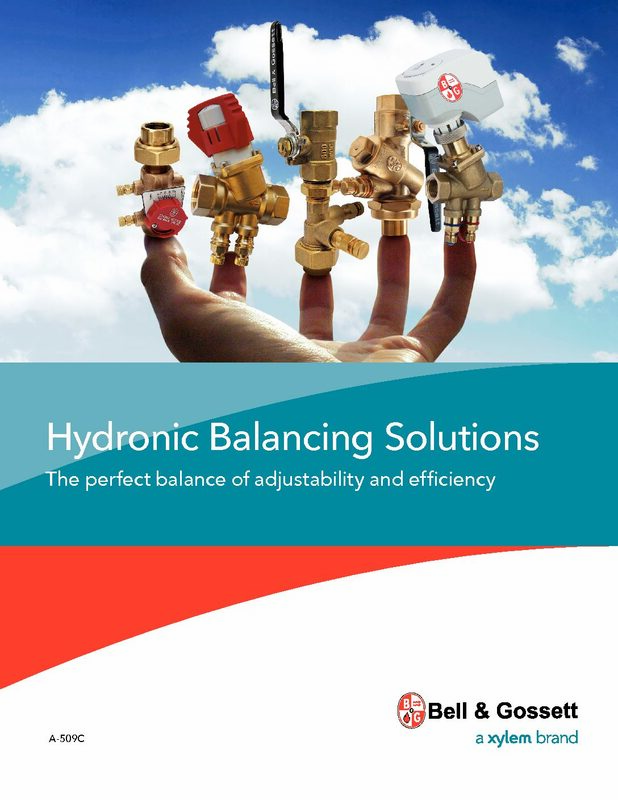 You’ll find the best source of knowledge you’ll need to achieve energy savings in hydronic systems at Bell & Gossett. Bell & Gossett focuses on the whole system in a practical way to help make your project perform the way you want. We’ve been sharing this knowledge with the industry for more than 90 years through our HVAC Representatives, and for more than 50 years through our famous Little Red Schoolhouse, and through involvement with industry groups. We are happy to share our knowledge with you. Limit Hydronic System Head Losses In Distribution Systems To One Half the Head Losses of Branch Piping A 2:1 Branch To Riser Pressure Difference Ratio Allows the System to Flow 90% of Design Flow and Limits Impacts On Other Branches. It Can Also Lower Pump Head. Use Dual Function Balancing Valves Like B&G Circuit Setter’s or Circuit Sentry to Help Adjust Sub-System Pressure Losses and Replace Extra and Unnecessary Shutoff Valves Balancing Valves Don’t Add Any Unnecessary Pressure Losses To Hydronic Systems, and Help Assure Design Flow to All Circuits.